In the same way we can not panic over the struggles of nearly every 1st round RB, you should not jump the gun on the following players in most 10, 12 or even 14 team leagues. Ben Tate went out with an injury, but it doesn't appear to be too serious. Crowell ended up scoring 2 short yardage touchdowns on 5 carries but it was Terrance West who got the majority of the carries with 16 and rushed for 100 yards. Smith had a great debut with the Ravens hauling in 7 catches for 115 yards and a touchdown. The touchdown was an 80 yard bomb. But let's be real, Joe Flacco threw the ball 62 times and I don't think the Ravens ever want that to happen again. Also Torrey Smith and Dennis Pitta are the first options for Flacco. Forsett benefited from Bernard Pierce fumbling the football and being benched. Forsett ended up rushing the ball 11 times for 70 yards and a touchdown. Pierce will most likely get the starting nod again next week when the Ravens face the Steelers. But after next week Ray Rice is back and he'll take over. 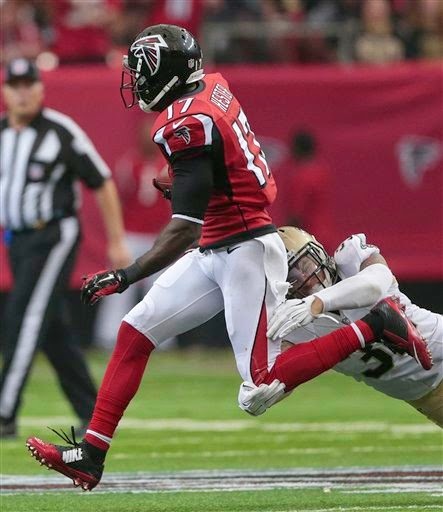 Hester was targeted 6 times by Matt Ryan and finished the game with 5 catches for 99 yards. Ryan on a weekly basis will target Julio Jones and Roddy White about 85% of the time, and Levine Toilolo is the red zone threat for the Falcons.